I became a citizen just this April. It was very, very, very exciting! I believe all people have the right to achieve their dream, whatever that may be. For many, my parents included, it was a dream to come to the United States to provide a better life for their children. 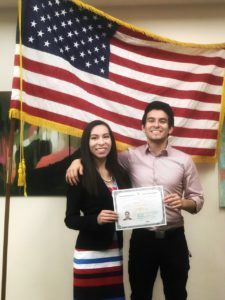 Viridiana and her brother Jesus celebrate her naturalization. My father was an accountant in Mexico. My parents were just getting started with their careers and they had just bought a house, but it was very unusual for people where they were living to have an education. Criminals in their town were targeting people who had stable jobs and whom they believed were well off. We were away for a weekend and our house was broken into. My parents were scared their town would grow more violent. They didn’t want to wait for the worst to happen and wanted to make sure that their family was in a safe place. They had friends who had moved to California in the United States and that’s what began their journey. I was three years old when my parents brought me here. I have gone through all my schooling in California since preschool. The only thing I really remember is feeling scared that I didn’t know what kids were saying. It was always Spanish at home and it still is. I’m very grateful for that. I like to read in Spanish and it has helped me in my career. There was a community center where we lived and it’s very much a pillar of the community. For many immigrants, it’s the go-to place. It was walking distance from where we were living which was essential since we did not have a car. The community center would help you with getting medical services, enrolling kids in school, and it had pro bono attorneys. That is where my mom went to enroll me in preschool, which at the time wasn’t super common for Latino families. I remember it was predominantly white students who were in preschool, but my parents valued education so they enrolled me in school to learn and assimilate. My parents attended ESL classes there as well. There was a library right next door, which was amazing for me, as I always loved to read. There was always this fear, growing up, you had to keep your head down and stay quiet and don’t make yourself stand out because we were undocumented. I was an excellent student, but I didn’t participate in as many things as I would have wanted to because I was afraid someone would ask me if I was undocumented. My friends, who were mostly white and were born here, didn’t know my situation. My friends turned 16 and got a driver’s license; I could not do that. In 2008 I graduated high school, which was an election year, and my friends were all starting to register to vote; I could not do that. I kept it buried in the back of my mind, I know I’m undocumented but I don’t talk about it, especially when everyone else just assumed I was born here. My parents wanted my brother and me to receive a college education, telling us it was the only way to succeed and get ahead without working two or three odd jobs trying to support our family. At the time I thought that’s what everyone had to do, everyone had to work that much. Most of my friends were white, however, and their parents were college-educated. I obviously saw a difference and I thought, “That’s odd, my parents have to work way more than your parents.” It seemed unfair but my parents said, “Well, you know their parents went to college. You should go to college.” My parents paid for my entire college education because I was undocumented and I couldn’t get financial help. That was very, very difficult for them. My parents instilled the importance of a higher education in me, so I am very grateful for that. In 2012, my senior year in college, I got DACA and my immigration status changed. I was able to start working with a work permit. I got married in 2013 and my husband petitioned for me to get a green card. But since I had entered unlawfully with my parents, I had to travel back to Mexico and then come back into the United States. It was an extra step for my particular immigration situation. I was 22 the first time I went back to Mexico. I visited many relatives, but it was bittersweet. My grandmother passed away while I was there. Even though I was born in Mexico, I grew up in the U.S. and my immediate family lives here so I would often forget how difficult it is for my parents to have their relatives live so far away, it really hit home. Now that I also have parents who have moved back to Mexico, I am glad I can travel as a U.S. citizen. When I got DACA, I had a work permit and I saw all the wonderful things I was able to do. My undergraduate degree is in environmental sciences so I was working at farms with many migrant workers when I was in school at UC Davis. Working with migrant workers shifted my interest in career choice. I began volunteering as an interpreter at the UC Davis law clinic and got interested in helping immigrants. I wanted a job where I would have the opportunity to work with immigrants and learn their stories. I too went through the immigration process that many of my clients are going through. I understand that it’s a scary process to put yourself out there when for many years you had to stay in the shadows. Canal Alliance stood out to me because I liked the way they displayed their clients’ success stories on their website. I could connect with the stories. Canal Alliance is a nonprofit champion of immigrants who are challenged by a lack of resources and an unfamiliar environment. I just had to be part of that nonprofit right away. I am now accredited by the Department of Justice to represent immigrants. I love getting to know our clients, and learning their stories. I see my family and myself in them a little bit. I’m not afraid to tell them my story anymore and I want my clients to know that it wasn’t super easy to get where I am now. Most of our clients are seniors who have been permanent residents for over 20 years and they are still afraid. They don’t want to apply for citizenship for many reasons; they think their English isn’t good enough, they think their writing isn’t good enough; they think they won’t be able to learn U.S. history. I lead the citizenship classes here at Canal Alliance. I tell the students it won’t be easy, but it’s definitely worth taking those classes. I try to get them excited about it. We are definitely trying to learn from the New Americans Campaign how we can get more clients involved in becoming citizens. I get to be part of our clients’ journey. I help fill out their naturalization forms and I try to do whatever else I can to help them achieve their dream of becoming citizens of the United States. I believe their win is our win.